Too much of our firearms training is static. That is to say, we seem to spend most of our time and ammunition shooting at single, motionless targets standing directly in front of us. Since this scenario has little to do with what we encounter on the street, why do we continue to train this way? One reason may simply be tradition, or “…because that’s the way we’ve always done it.” That’s not a good enough reason for me either, so what say we just forget that one. 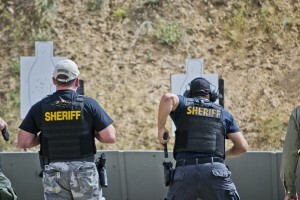 Other reasons might include: “We don’t have any moving target equipment.” or, “We have enough trouble just getting our trainees to hit the targets that are standing still!” These are valid concerns, and in this article I hope to offer some suggestions and advice that will help you to overcome them both. First, we should consider the reasons why we need to include moving targets in our firearms training. Let’s review some of the common dynamics we now recognize from the hundreds of real-life police gunfights studied over the years. The vast majority of these confrontations happen within 10 feet or less, and the time span of actual shooting is usually less than 3 seconds. 60—70% of these altercations occur in an environment of low, altered, or failing light. Nearly half of the time there are multiple adversaries to contend with. While the statistical studies don’t usually specify the type or degree of the movement involved, we know that people move—especially when they are fighting. Movement to retrieve a weapon, movement to attack, movement to or from a covered position, movement to break physical contact. The fact is, real targets in the real world really move, and our firearms training needs to prepare us for this reality. Clint Smith, internationally known firearms instructor and the Director of Thunder Ranch, often uses this simple demonstration. He will raise both of his hands up about head high, palms forward. His left hand remains motionless, but he moves his right hand erratically up, down, and back and forth. While doing this, he asks the class, “If one of my hands represents you, as a target that is about to be shot at, which target would you rather be?” The answer (for most of us) is obvious. We would choose to be the moving target, because we know that it is much more difficult to hit a moving target. 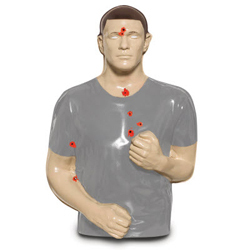 To hit a moving target, one must apply the same basic principles of marksmanship needed to hit a stationary target, i.e. sight alignment, trigger control, and smooth follow-through. Keep the sights aligned in the center of the target as you track its movement. At the same time, the trigger finger is applying steady, even pressure on the trigger until the shot breaks. 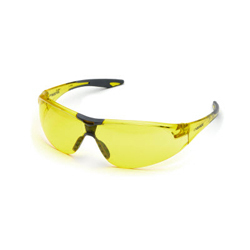 Here’s the critical part: as the shot breaks, continue to smoothly track the target as you recover from the recoil and reacquire your sight picture, and allow the trigger to reset as you prepare to make additional shots. The tendency is for us to stop swinging the gun with the target at the moment of firing, thus resulting a shot going where the target was, instead of where it is going. In my experience, this lack of follow-through is the most common cause for missing shots at a laterally moving target. Yes, it is challenging, but the only way to learn to do something well is to practice doing it. As skill and confidence improve, we can increase both the speed of, and the distance to the target, and eventually reintroduce movement by the shooter. For this sort of training to be possible, of course, you will need some kind of a moving target system. For those of you with an extremely tight budget, a bit of imagination and resourcefulness are in order. Here’s an example: with a little red wagon, a target and stand, some clamps, stakes, pulleys, and a length of rope (don’t forget the duct tape and bailing wire), you can put together a crude, but effective, moving target system powered by manual labor. 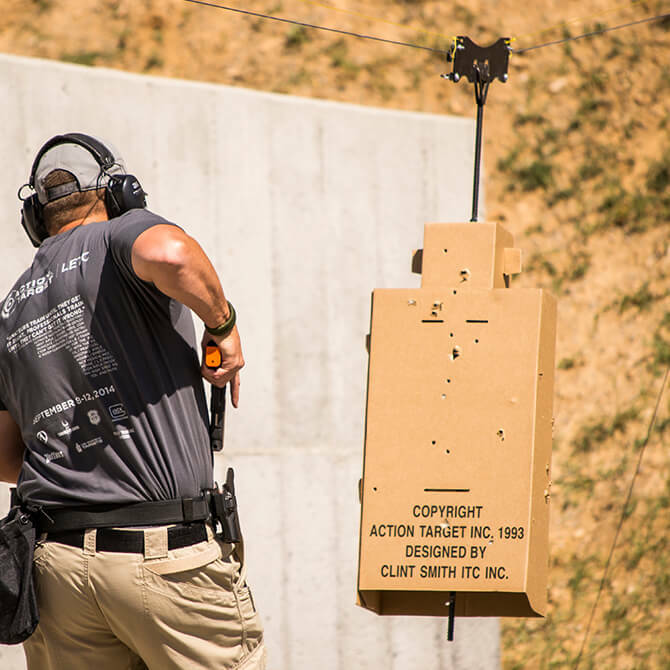 If you train on an indoor range, there is probably a target retrieval mechanism in place that can be used to simulate a target that is charging or withdrawing, often with more than a little swinging and bouncing movement included for good measure. For more advanced solutions, Action Target offers several options for animating your targetry. The Action Target Track Runner is a premiere moving target system designed to be part of a permanent installation. 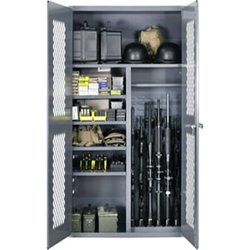 It provides a smooth, wind-proof way to move one or more target carriers laterally at variable speeds. The range officer uses the control box, which is connected to the target system’s electric motor, to start and stop the targets, and change their speed and direction. Because of the Track Runner’s power and advanced design, steel targets can even be incorporated on the target carrier to provide instant visual and audible feedback. One of our most versatile pieces of equipment is the Portable Runner . 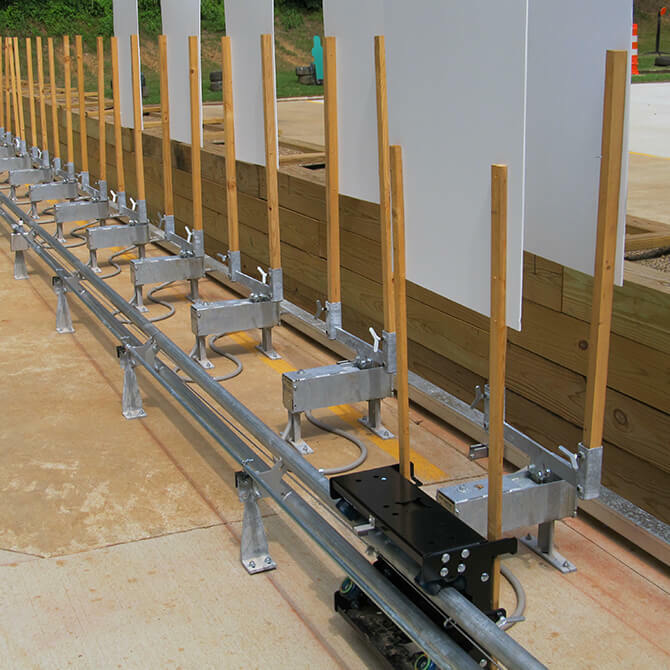 This system uses a motor and control system similar to the Track Runner, but instead of being mounted on a permanent track, the target carrier is suspended by an overhead steel cable. 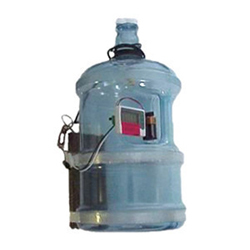 The motor and pulley mechanisms are each supported by single piece of 8-foot long 2×4 lumber. 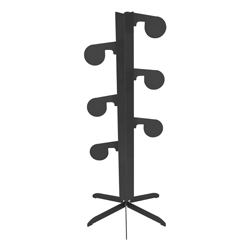 The whole thing can be set up, virtually anywhere, in less than 20 minutes. Because of its portability, the target can be set to run perpendicular to the Line of Fire™, or at differing angles. One of my favorite uses of the Portable Runner is to set it up as a charger. We can run the target directly at the shooter, who must smoothly back up away from the attacking target while drawing and shooting. Combine this setup with the Action Target 3-D (cardboard torso supported by balloons) silhouette target, and you have a realistic looking threat that will now react to accurately placed shots by by falling to the ground. No matter what kind of range equipment you may have, I hope you recognize the critical need for instructing our trainees in the important tactical and marksmanship skills they need to accurately and effectively engage moving targets. In our earlier review of police gunfight statistics, I didn’t mention the numbers that reflect our real-world marksmanship performance. These numbers will vary a bit from year to year, but the U.S. national average hit-ratio is about 1 out of 6, or roughly 15%. That is, for every six shots deliberately fired by officers during armed confrontations, only one of those six shots will hit its intended target. That means that 85% of the shots fired during these gunfights are hitting something other than the intended target, often causing expensive property damage, injury, and sometimes death. You don’t need me to tell you about the unpleasant financial, political, and emotional consequences that can result from these errant bullets. Do you think that our officers would achieve better results in their real-world shootouts if they were regularly training on moving targets? I do too. 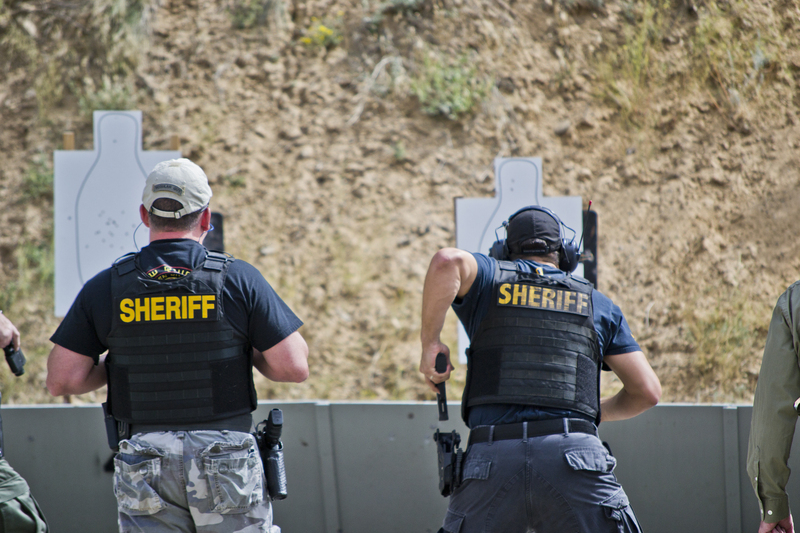 It is up to us, as firearms instructors, to provide these kinds of training opportunities. We can do better. We must do better. Many lives depend on it. ‘Nuff said. Now, let’s get moving! Our Portable Runner gives you all the performance you need to take your training program to the next level. Track Runner™ targets are mounted to a trolley that runs on a special track on the ground or inverted from an overhead structure. 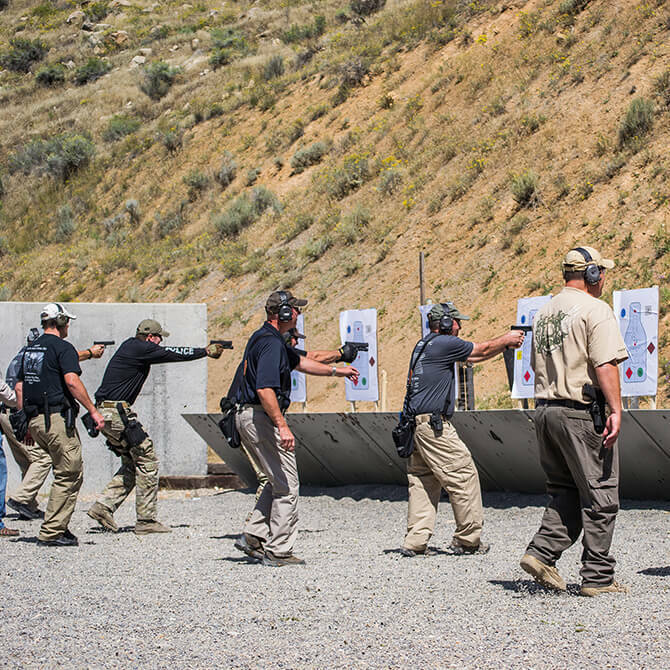 Line of Fire™ is a revolutionary concept in firearms training and range design, providing you with six specialized training tools.